Aiming to Attract More Athletes? It’s annoying, isn’t it? Too many people view physical therapy as only necessary for old people and surgical recovery. But, you know how beneficial it can be to young, healthy athletes! You also know that appealing to a younger audience is a great way to expand your practice and increase patient retention and reactivation. But, that doesn’t just happen overnight. If you want to win at sports medicine marketing, you need a game plan and careful preparation. There’s a “look” when it comes to sports marketing. We’ve all seen it! Dark background, intense, action-oriented image, modern fonts, and a bold infusion of 1 maybe 2 colors. And yes, everyone else is doing that. There is a risk of getting lost in the noise. But, the bigger risk is not being taken seriously by athletes because your promotional materials don’t have a sense of energy and achievement. The first, your practice is already branded heavily with athletic imagery and appeals to a younger sports-minded audience. If that’s the case, you likely don’t need to worry about your branding. Just keep up the good work! The second type is your practice is a more traditionally branded, trusted therapy or rehab practice looking to expand your patient base to a younger crowd. Let me dispel any fear here – you CAN still win at sports medicine marketing! If your practice is like the second one, don’t rebrand your practice at the risk of alienating your existing patient base. Consider creating a sports or athletics program and, instead, branding that as a sub-product (think Microsoft Windows vs Microsoft XBOX). Create a name and logo that connects to yours, but fits the sporty image you need. For example, “Johnson Physical Therapy Center” might introduce “Johnson ATHLETICS” as a bold new service. Finally, create a variety of marketing materials using this sub-brand that feature images, colors, and topics that will resonate with your new audience. At the least, include brochures, postcards, information packets, business cards, and a section on your website. For more tips on Branding and Marketing Your Practice, Download these Free Guides to More New Patients! When an athlete suffers a major injury, the following days and weeks are often a whirlwind of questions, confusion, physician appointments, and for many, emotional trauma is very real as their favorite activity suddenly feels impossible. This is a very tough place to catch a potential patient and you are likely more at the mercy of a referral than your own marketing. Become Known for Teaching Injury Prevention. If your primary message is “come to us if you get hurt,” it’s not likely you will get enough time in front of athletes and coaches to build trust. You see, nobody thinks they’re going to get hurt. Sure, they may acknowledge the possibility, but no young athlete spends time actually thinking about it until it happens. Advertising value in a hypothetical future event is a tough sell. Instead, create value for your audience in their life NOW. Tips on how to avoid injury are very applicable and helpful to their life immediately. Athletes will listen as you prove your expertise. Coaches and parents especially will pay attention and open doors for you to build trust because safety is amongst their top daily concerns. Think of injury prevention like a free ebook on your website – meant to help where they are now in order to be trusted when they need more help later. Create handouts and workshops that can be replicated wherever you get the chance. Offer Help with Smaller Pains and Performance Issues First. This is almost a tack-on to the last point. Spend some time & materials teaching what aches, pains, or limitations should be addressed before they become a major problem. “Achieving Peak Performance for Athletes” or “How to Know When a Small Pain Needs Attention” would be some examples of topics that allow you to connect with them and potentially make them a patient prior to any major injury. You may already be doing this, it seems like an obvious choice, right? The audience is right. But, you may also feel like the results are lackluster. 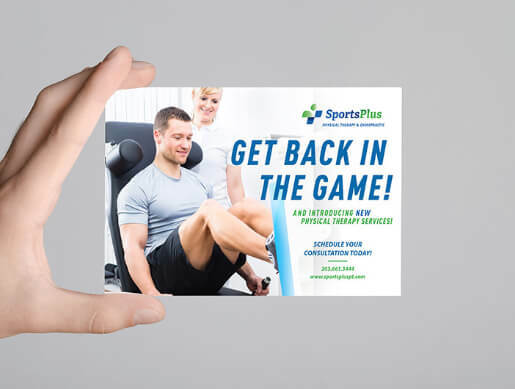 Knee pain & sciatica rack cards on the front desk might help a little, but to be the most effective they should be part of a bigger gym marketing plan. You’re going to need a value offer. Something that connects with people right where they are and gives a little free help. How do you take this advertising to the next level without the gym becoming wary of solicitation? Remember all the great benefits of teaching injury prevention? Apply the same concept to working out. Develop a small handful of posters that show the proper posture and technique for common workouts. 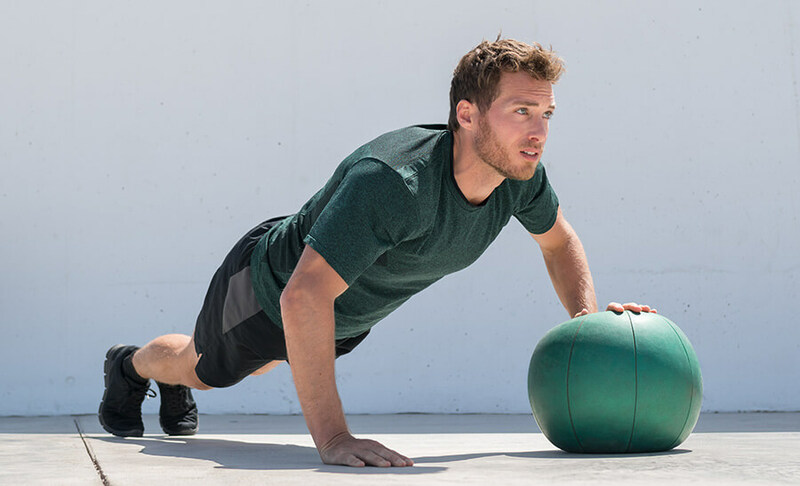 Quickly explain how these tips can help avoid injuries that affect performance and set the athlete back in their goals. Brand these posters with your sports program logo and finish with a small call out to call or visit your website for sports injury recovery. Focusing primarily on safety will make these posters a valuable piece for the gym owner to put up. This tactic doesn’t need to vary much from existing workshops you run. Helping gym customers with back pain or other common issues is a great value add! Assure the gym owner you’ll be teaching them how to work out better which encourages them to keep their gym membership. Also, that people from your patient list will attend offering a chance for new gym customers. Lastly, offer that if any customers sign up for therapy you’ll encourage them to keep up maintenance at the gym after their care. Assuming your practice doesn’t have a public gym, ask about a deal where your patients get a special membership discount. In return, members of that gym can receive a free evaluation or something else of value for your services. Once a deal is in place, be sure to make postcards or other materials to advertise in both locations. Depending on where you are, student & teens can make up a large portion of local athletes. Hosting sport-related workshops at schools & inviting parents, getting time at preseason camps & workouts to talk about injury prevention, monthly workout & recovery newsletters for coaches and administrators – these are all ways to promote brand awareness and gain trust as a local expert. For athletes under 18, your marketing is about planting small seeds of information and maintaining the right athletic image. Remember that you’re talking to someone who isn’t likely the primary decision maker in their own healthcare. Portray the right, sport-loving, trustworthy image but don’t worry about closing any signups. What is the number one concern of any hockey, soccer, or football mom? It may seem like playing time but at the end of the day, it’s little Johnny not getting hurt. This is where the injury prevention talk above really comes into play. If you’re able to get parents to a workshop about preventing teen athlete injuries you’ll have their very dedicated attention. Otherwise, prepare handouts for the school or athletes to pass to parents. Also, keep the topics simple such as “Preventing long-term injuries in teen sports” or “How to know when your child’s pain needs attention.” Just remember you don’t want to scare them. The goal here is to assure them that safety is being paid attention to and even if something does happen, the right care can lead to full recovery. Coaches can be a mixed breed. Much like players, performance is more likely to keep them up at night than safety. That said, they likely face daily pressure from superiors about safety and administrative responsibility. Your goal in coach relationships should be to resonate with their desire for better performance while showing empathy – and a solution – for their pain of satisfying safety requirements. Pro tip: don’t ignore summers with coaches. They may not be in the office consistently, but if you can use email marketing or send direct mail to their home at least once over the summer you’ll be in a better place once fall sports kick off. Administrators will both be your best foot in a door and the busiest people to gain attention from. Whether for a school or local club, these are the decision makers when it comes to getting workshops, handouts, or parent info opportunities. Safety with regards to sports injuries is a large part of their focus and they know parents hold them responsible. So, that’s a great route to take in messaging. Just remember, day to day they’re swamped with logistical details so be straight to the point and prepare materials to leave behind in case you need to follow up later. So far, we’ve discussed your branding, messaging, and a few ways to build relationships that will bolster your sports medicine marketing plan. I know, sounds exhausting right? Getting started certainly may take work but once you’ve established some relationships and have the messaging down things will flow more easily. That said, how about a tactic that doesn’t require much time at all? Football injury, hockey injury, or any sport that is popular in your area. For additional ideas, Google some of these terms in your city (or any city!) and read a few results. You can also check out our article on SEO for physical therapists! At the end of the day, marketing your sports injury services boils down to one simple element – delivering the right image and message to your audience. Whether you’re a specifically athletic clinic or looking to expand your patient base, you can create a winning game plan with the right understanding of who you’re talking to. One final piece of advice? Start now. Don’t wait until the next sports season to prepare for your success. Whether it’s new printing new advertisements, redesigning part of your practice website, or building coach/administrator relationships, these things take time to get in place. Every athlete knows the benefit of preparing ahead of time… and you should too!